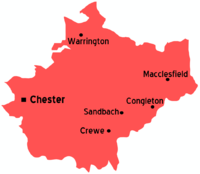 For other places with the same name, see Cheshire (disambiguation). Cheshire is a county in England. Chester - the county town, with a rich Roman history and good shops. The Cheshire accent is not a strong regional accent and is often associated with Received Pronunciation (RP), but several regional accents and dialects like Scouse are common in Cheshire, due to the proximity to cities like Liverpool and Manchester. Crewe station and Warrington Bank Quay are on the West Coast Mainline, which gives them good connections to London, Birmingham, Glasgow, Edinburgh and a variety of other destinations. Chester has more infrequent services to and from London and the Midlands, and regular services to and from North Wales, Manchester and Liverpool. These last three are largely commuter lines, so do not expect major luxury, though they pass through enjoyable country scenery. Manchester Airport is located just north of Cheshire and serves a large number of international and domestic destinations. Liverpool John Lennon is similarly located nearby and has mainly budget airline connections to European destinations. It will not be possible to get to most places in Cheshire direct from here, rather you must go to the main train stations in that city and use that. Prior to boundary changes in 1974 and the creation of areas like Greater Manchester and Merseyside, Cheshire included everything south of The Mersey such as Sale, Hyde, and Stockport and continued upto The Welsh Border near Chester. Cheshire is famous for its countryside and largely unspoilt landscapes. The historic roman city of Chester (Deva) is a popular tourist destination because of its ancient city walls, amphitheatres and Mediaeval/Tudor buildings. This page was last edited on 1 July 2015, at 21:44.